One minute for all, all for a minute. 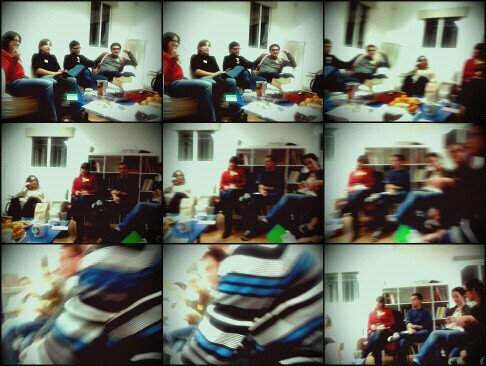 First HF in 2011, Madrid. The Hora Fetén is a casual monthly-ish gathering to take the pulse of a moment. My now-husband Manuel Manrique Gil and me started it in 2011 in Madrid, and it currently takes place in Brussels. It is strictly formatted, each guest (every single attendant) speaks for one literal minute. The topics are totally open, each one brings their personal obsessions: what they are reading, listening, what they find themselves thinking about while the kettle boils. Everyone speaks one after another, without interruptions nor questions. After all the “minutes” have been shared, questions are welcome. Then the conversation moves towards linking the different topics, finding connections, overlaps, and related insights. The Hora Fetén was specifically designed as a way to provoke good conversations. The format is informed by the saying that if someone does not partake in a conversation within the first 20 minutes, they will remain silent. The current Hora Fetén community co-moderates the events very minimally, and every month we have a voluntary host. This means the Hora Fetén usually has a domestic backdrop, making it intimate and close. Manuel is working on The Hora Fetén Chronicles, a collection of all the topics brought up across the years. A publication is being designed in collaboration with my sister Marta Gil Ulldemolins. If you want to attend, please feel free to reach out.